In this example I’m going to use the capitals of the Scandinavian countries: Stockholm, Oslo and Copenhagen. Each capital will be displayed on the map with a marker. When you click a marker an InfoWindow will popup with some brief information about the city. "description": "Stockholm is the capital and the largest city of Sweden and constitutes the most populated urban area in Scandinavia with a population of 2.1 million in the metropolitan area (2010)"
"description": "Oslo is a municipality, and the capital and most populous city of Norway with a metropolitan population of 1,442,318 (as of 2010)." "description": "Copenhagen is the capital of Denmark and its most populous city, with a metropolitan population of 1,931,467 (as of 1 January 2012)." The content that will be displayed in the InfoWindows. I’ve included some HTML in it to illustrate that you’re not restricted to just plain text. Note: In this example I have the JSON data in the same js file as the code, but in a real-life scenario you would probably grab it from an external source such as a back-end server or a web service. First of all we need to create a map. The map will be centered over Scandinavia so that both Stockholm, Oslo and Copenhagen are visible. If you feel unsure how this all works I recommend that you read Google Maps API 3 – The basics. It describes how to create a simple map. To create markers from the JSON-data we need to loop through it and extract the information for each marker. This will add markers to the map and they will all have their own unique title which will show up as a tooltip when you hover over them with the mouse. 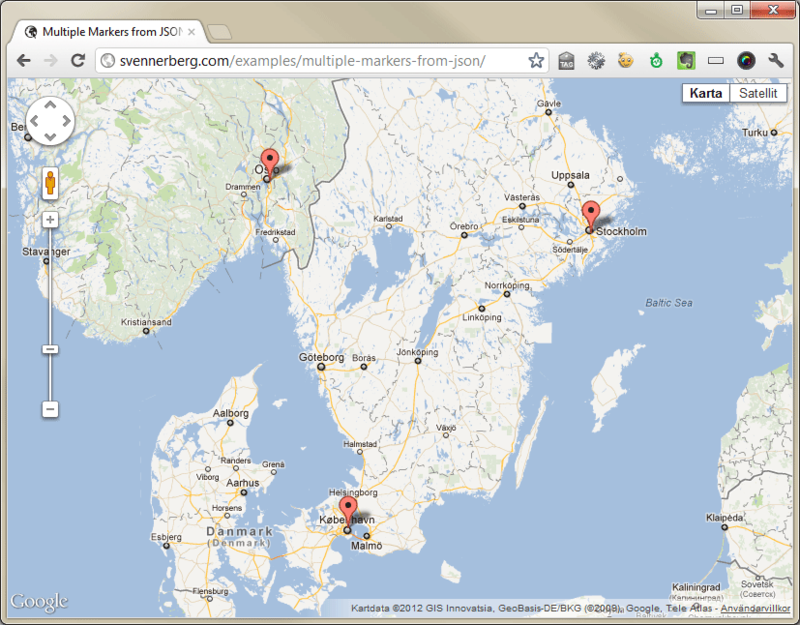 Ok, so now we've created a map and added some markers from JSON data. So far it hasn't been that hard, the way of doing this is pretty straight-forward. But to attach the InfoWindows properly is a different story. It's now that it starts to get tricky. This gives us an empty InfoWindow object that we can use on the map. The next step is to attach a click event to each marker. In the code that executes we will fill the InfoWindow with the correct information and open it att the right location, pointing at the clicked marker. The problem with this approach is that when you're trying to add more than one InfoWindow, they will all have the same content as the one in the last iteration. To prevent this from happening we need to use something called a closure. What a closure does is to persist the data in each iteration of the loop so that it's bound to that particular marker. One way of doing this is by encapsulating the code inside an anonymous function that is instantly executed. You need to make sure to pass the information from the current iteration to the anonymous function. In our case we're going to pass the current marker and the current data. This is kind of a confusing concept and a bit hard to explain, so lets instead look at some code. By passing the data to the anonymous function we make sure that it will stay there. We're essentially creating 3 self contained objects (closures) from our 3 locations. Now if we're try the code, it will work perfectly and each InfoWindow will display the right information. Tip: Nicholas Johnson explains how closures work in 5 easy bullet points in his short post, What is it with Closure? I hope that this example will clear out some confusion on this topic. Closures are a pretty confusing concept but once you understand how it works, it's something you we'll easily be able to apply in your own code. Anyway, you should be able to grab the code from this example and use it as a boilerplate to tweak your own needs. The closure does not work for me. I see three markers but only Copenhagen displays an infoWindow. Can you please post the entire code as one page? You can always check out the code in the Live Demo. Here’s a direct link to the js file. Thank you! I got it to work, I think I had the order mixed up. this very helping for me. Hi – I’m working through your book (which is great btw), and trying to use the above example. However my base code is ColdFusion. I have a query from my database which I can convert to a JSON object with serializeJSON. However my format is very different from your example and I can’t see how to loop over the json object I have. Is there a quick way you can see that I can read it or is there another way I should go. Thanks for the elaboration/clarification. I bought your book last year and highly recommend it! That’s nice to hear. Thanks for the recommendation! I bought your book. I want to know how to implement this same feature to read a json file instead of what is currently there. Regards. but what if I want one info window open on page load? I have used code above and ‘infowindow’ is not working with Stockholm and Oslo… I can only see an infowindow after clicking Copenhagen. Could you please let me know that what could be wrong at my end. I’d been thinking that the first “(marker, data)” (ie. at line 1) was the passing in of the parameters, but I’m guessing that the parameters are actually being passed in at line 9. Is that correct? If so, then could you explain the purpose of specifying (marker, data) after the function keyword in line 1? wow… I was struggling with this for like hours. Thank you for this post. The page with the JS cannot be found, please can you show me the source as only the one marker displays the infobox. Hi, with your article (and of course your book) I had been able to implement more markers on a map. What about adding differnt icons to different markers in a Json array? I’ve been struggling for a week trying to integrate JSON data with OverlappingMarkerSpiderfyer and closure was the only way I could get it to work..
is it possible to add the json data that google maps customize app provides? I was stuck on the whole “closure” thing for two hours! THANK YOU! Your instructions fixed my problem so quickly! I am trying to do something similar, but want to load the data from the JSON file, and than use it to display as a marker on the map. Could you please guide what I should be doing? Could you please help me with this? I will really appreciate it. Thanks. Hoping to hear back from you. For jshint, when you’re imp implementing the closure (marker,data), an error comes up “Don’t make functions within a loop”. Do you have a fix for that by chance?